Jim and Shelley Douglass moved right next door to the Trident submarine base — Ground Zero of the nuclear arms race — and organized a boat blockade that led to an epic confrontation with the Navy and Coast Guard on the waters of Puget Sound. Jim and Shelley Douglass helped to organize one of the nation’s most significant and multifaceted campaigns of nonviolent resistance when they uprooted their lives, left their home behind, and literally moved right next door to Ground Zero of the nuclear arms race, in a home adjacent to the Bangor Naval Submarine Base in Kitsap County, Washington. Their new next-door neighbors were a fleet of Trident submarines and an unimaginably destructive stockpile of Trident missiles in weapons bunkers. Lockheed missile designer Robert Aldridge had visited the Douglasses at their home in Hedley, British Columbia, to warn them that Trident missiles were first-strike nuclear weapons due to their pinpoint accuracy, short flight time and cataclysmic firepower, and would be based across the border on Puget Sound near Seattle. In response, Jim and Shelley Douglass co-founded Pacific Life Community (PLC) with other Canadian and American peace activists in January 1975 to begin the Trident campaign. In September 1978, Jim and Shelley Douglass moved to Kitsap County to work full time at Ground Zero. Douglass explained that the couple had found that they could not offer genuine resistance to the Trident submarine by coming in as outsiders to organize protests, so they became Kitsap County residents. 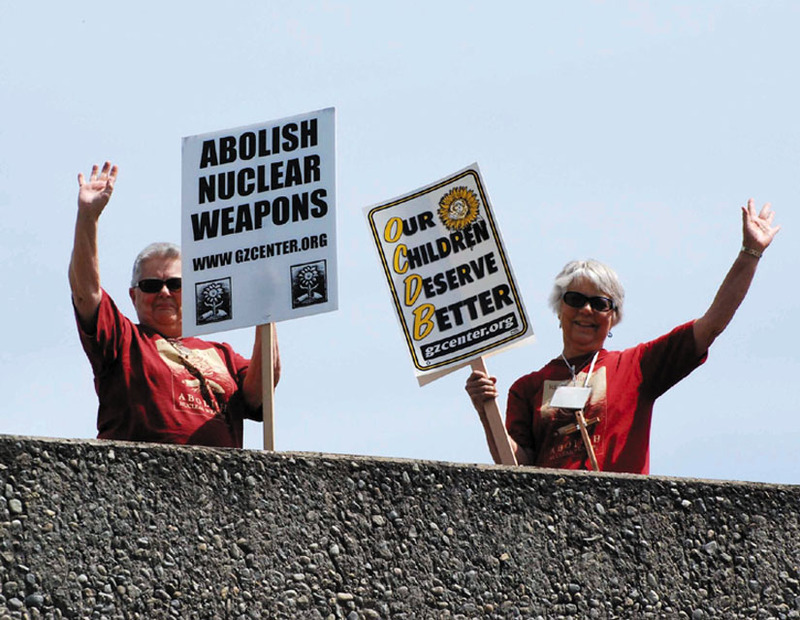 Now neighbors as well as Trident resisters, they began reaching out to the naval employees working at the Trident base. The Ground Zero Center sat on a piece of land that shared 330 feet of fence with the Bangor naval base. On one side of that fence, the U.S. Navy was equipping a fleet of Trident submarines with enough firepower to incinerate millions of civilians in a radioactive firestorm and destroy every major city in every country in the world. On the other side of the fence, Ground Zero began building a nonviolent movement based on the teachings of Martin Luther King and Mohandas Gandhi. On one side, U.S. marines with shoot-to-kill orders guarded nuclear warheads in storage bunkers. On the other side, activists held nonviolence trainings and prepared to go to jail for obstructing the arms race. Ground Zero members gave leaflets to thousands of workers entering the Trident base every week for several years. Activists by the hundreds were arrested for climbing the fences surrounding the naval base, walking inland to pray for peace at high-security nuclear weapons bunkers, blocking trains carrying hydrogen bombs into the base, and sailing their small boats in a peace blockade of the massive Trident submarine protected by one of the world’s largest naval forces. Ground Zero’s campaigns attempted to encompass all the dimensions of Gandhi’s vision of nonviolence, from militant confrontation with injustice, to reverence for the lives of people on all sides in the conflict, to education and dialogue. At times, that made their actions seem almost like a contradiction in terms. For even as Ground Zero organized some of the most militant acts of anti-nuclear resistance in the nation, it also strongly embraced the ethical values of nonviolence taught by Gandhi, King and Jesus in the Sermon on the Mount. The same activists that were pushing nonviolence to its outer limits by staging increasingly radical confrontations with the U.S. military, were also highly committed to recognizing the humanity of the naval base workers, both civilian and military. They spent hundreds of hours trying to create a dialogue with Trident base personnel and refused to see them as the enemies of peace. The Ground Zero Center also inspired activists in hundreds of communities around the nation to hold vigils on railroad tracks to block the White Train shipments of nuclear warheads from the Pantex hydrogen bomb assembly plant in Amarillo, Texas, to the Bangor base. One of Ground Zero’s most far-reaching successes was the enormous impact it had on the nation’s faith communities. Countless bishops, ministers, priests, rabbis and nuns were directly inspired by Ground Zero’s nonviolent campaigns to become personally involved in speaking out against the nuclear arms race. Jim Douglass was an influential theologian and former professor of religion at Notre Dame and the University of Hawaii, and the author of such renowned books of peace theology as The Nonviolent Cross and Resistance and Contemplation. Shelley Douglass also was a theologian and an eloquent writer on nonviolence, and several other members of Ground Zero were deeply involved in Protestant and Catholic churches and Buddhist orders. Ground Zero activists had intensively studied the movement-building strategies and ethical values of Gandhi’s satyagraha campaigns and the U.S. civil rights movement, and their commitment to principled nonviolent actions enabled them to have a profound impact on faith communities. Undoubtedly, the most inspiring religious leader who worked closely with Ground Zero was Seattle Archbishop Raymond Hunthausen, one of the most courageous and radical opponents of nuclear weapons. The archbishop was deeply supportive of Ground Zero’s nonviolent protests, and, in turn, Hunthausen greatly inspired Ground Zero and the peace movement as a whole when he became one of the nation’s most outspoken voices for peace and disarmament. His call to rebellion against the arms race, “Faith and Disarmament,” was given on June 12, 1981, to the Pacific Northwest Synod of the Lutheran Church. In the immediate aftermath of the archbishop’s uncompromising call to resistance, many Catholic bishops, Protestant ministers and Jewish rabbis were moved to speak out against nuclear weapons. And the peace movement found new hope. At last, someone with the power to make his voice heard had the courage to call the Trident nuclear submarine what it truly was: an oceangoing Holocaust, an underwater death camp loaded with weapons of mass incineration that could ignite a firestorm and slaughter millions. Most importantly, Hunthausen didn’t merely call for a lukewarm set of reforms. He called for immediate nuclear disarmament and massive civil disobedience because of his conviction that nuclear weapons are criminal and immoral. During the first years of the Reagan era, when many progressive voices were muzzled or ignored, Hunthausen called for the outright abolition of nuclear weapons. What in the world could have ever led an American archbishop to denounce a U.S. weapons system as the Auschwitz of Puget Sound? If we are to understand Archbishop Hunthausen’s comparison of Trident to Auschwitz, we must retrace an amazing series of historic events that began in 1945, when Nazi Germany’s leaders were put on trial for crimes against humanity in the town of Nuremberg, Germany, the symbolic birthplace of the Nazi Party. During the Nuremberg trials, new cause for hope began to emerge from the destructive fires of war, and crucial principles of international law began to arise out of the ashes of Nazi concentration camps. In the autumn of 1945, a few weeks after the end of World War II, Allied forces held a series of trials for political, economic and military leaders of Nazi Germany. In the first trial, 23 top officials of the Third Reich were charged by the International Military Tribunal with war crimes for their roles in planning unprovoked wars of aggression, and operating death camps where millions of civilians were systematically exterminated. Twelve subsequent Nuremberg Military Tribunals were held from December 1946 to April 1949, where an additional 185 Nazi defendants were prosecuted, including doctors accused of forced euthanasia, judges who implemented racial purity laws, officials in charge of “racial cleansing and resettlement,” directors of the Krupp Group who manufactured armaments with a brutal system of slave labor, and directors of the company that made Zyklon B, the poisonous cyanide gas used to murder countless civilians in concentration camps. The Nuremberg Principles that resulted from these trials defined crimes against peace, war crimes, and crimes against humanity. They are now foundational principles of international law, and have served as models for The Universal Declaration of Human Rights, The Genocide Convention and the Geneva Convention. Nazi officials had been put on trial by the victorious Allied forces, and yet international law is just that — an international set of principles that applies to all nations, not just to nations that lose a war. Only 25 years after the Nuremberg trials were held, the U.S. government itself was being accused of war crimes in Vietnam when hundreds of thousands of defenseless civilians were deliberately massacred in saturation bombing campaigns, and targeted with napalm, Agent Orange, and anti-personnel weapons. 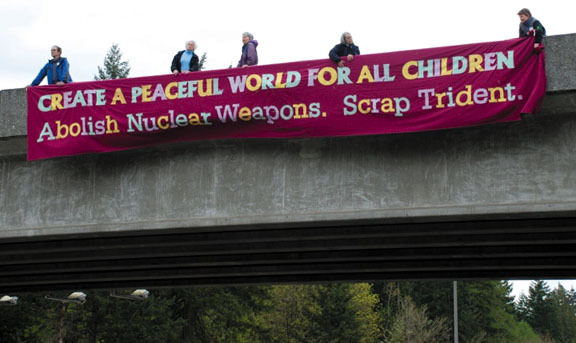 One particular protest against war crimes in Vietnam is the next step in this historic chain of events that connects the Nuremberg trials with the Trident submarine in the waters of Puget Sound. In 1972, Jim Douglass, then a professor of religion at the University of Hawaii, committed civil disobedience based on the Nuremberg Principles by pouring his own blood on top-secret electronic warfare documents. Electronic warfare and anti-personnel bombs in Vietnam indiscriminately slaughtered children and civilians and thus constituted a war crime. In a stunning historical twist, two of the U.S. attorneys who prosecuted Nazis for war crimes during the original Nuremberg trials, traveled to Hawaii to defend Douglass and his co-defendants, Jim Albertini and Chuck Giuli, after they were arrested and charged with destroying files on electronic warfare at Hickam Air Force Base. Mary Kaufman and Benjamin Ferencz were prosecuting attorneys for the United States at the Nuremberg trial, and now acted as defense attorneys for the Hickam Three, citing international law in arguing that they were acting in obedience to the Nuremberg Principles by pouring blood on top-secret files in order to bring war crimes to the attention of the American public. The USS Ohio (shown above) was the first in a fleet of Trident submarines. A single Trident sub has the explosive power of several thousand Hiroshima bombs and could destroy every city in an entire nation. Two key persons who attended this trial were Lockheed missile designer Robert Aldridge and his wife, Janet Aldridge. When Robert Aldridge heard the Nuremberg attorneys describe the nature of war crimes, he was stunned to recognize that his own life’s work in designing first-strike Trident nuclear missiles also constituted a war crime, and in the aftermath of that realization, he decided to resign from Lockheed Missiles and Space Corporation for reasons of conscience. It is striking how this single act of conscience by one person, supported by his family, would affect the course of the anti-nuclear movement in the United States. 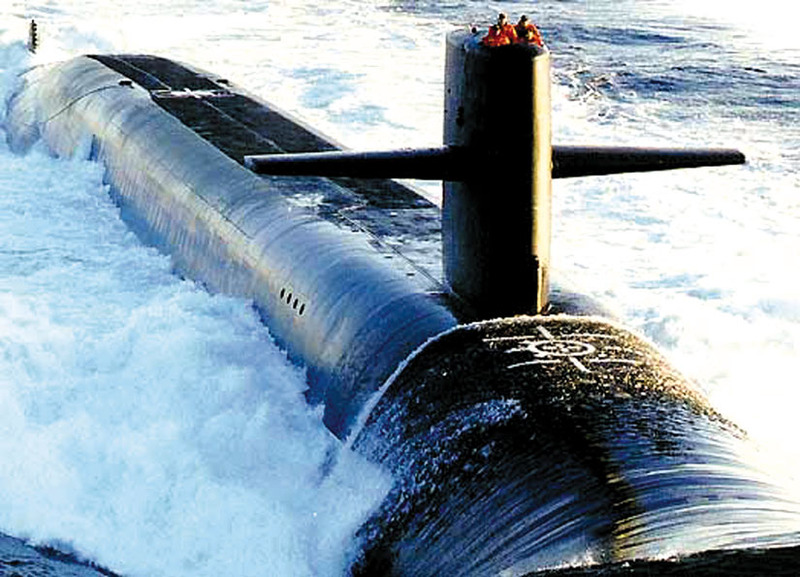 After the trial, Aldridge visited Jim and Shelley Douglass and warned them that the Pentagon was developing a submarine that would be the most lethal weapons system of all time. Trident’s accuracy, short flight time, and explosive power made it a first-strike weapon — and therefore a war crime. In response to Aldridge’s act of conscience, Jim and Shelley with other Canadian and American activists co-founded the Pacific Life Community, then launched the Ground Zero Center for Nonviolent Action. In that way, the Nuremberg trials had set off a chain reaction of conscience that reached all the way to Puget Sound — the home port of the Trident submarine. Then, this chain reaction continued onward, as the anti-nuclear resistance carried out by Ground Zero influenced Archbishop Hunthausen to publicly declare his support for these acts of civil disobedience — a bold and highly controversial step for a high church official to take, especially since the archbishop’s pastoral responsibilities included thousands of employees at the Trident base. Finally, the chain reaction of conscience that began with the Nuremberg trials in 1945 came full circle when the Seattle archbishop declared that the Trident submarine was a crime against humanity comparable in magnitude to the Auschwitz concentration camp. The next step in this historic drama was not long in coming. A year or so after Hunthausen condemned the Trident submarine, the archbishop was on a boat with other religious leaders in the waters of Puget Sound, a seafaring prayer vigil that was offered in support and solidarity for the nonviolent activists who had launched the Trident peace blockade. The confrontation between the unarmed power of nonviolence and the Auschwitz of Puget Sound came to a head at the Trident peace blockade on August 12, 1982. Jim Douglass and the Ground Zero Center were instrumental in organizing this dramatic and risk-filled blockade because of their determination to offer their lives in nonviolent resistance to the USS Ohio, the first Trident submarine. My then-wife Darla Rucker and I lived for two weeks on board a small sailboat, the “Lizard of Woz,” with Jim Douglass, captain Ted Phillips and his wife Eve Phillips. Also on board the boat were Bruce Turner and Chris Codol from Spirit affinity group — the peace community we had formed as seminary students at the Graduate Theological Union in Berkeley — and several other highly dedicated peace activists. Every activist on board the Lizard of Woz and the Pacific Peacemaker had contemplated the serious risks to our physical safety and the likelihood of years in federal prison, and had chosen to accept these risks as the price of peace. In the predawn hours of August 12, we received word that the USS Ohio was seen approaching the Hood Canal. The waters were suddenly swarming with a fleet of Coast Guard cutters that launched a pre-emptive attack on our tiny peace fleet. It was David vs. Goliath on the waters of Puget Sound. The Trident submarine was truly a behemoth — four stories high and 560 feet long (the length of nearly two football fields) — and it was protected that day by a fleet of 99 heavily armed Coast Guard ships, a fleet larger than nearly every other navy in the world, as Seattle newspapers reported. Our ragtag little peace flotilla had only two small sailboats and 20 tiny rowboats. Striking suddenly in the gray dawn, Coast Guard cutters rammed our sailboats, and then armed officers boarded the boats and pointed machine guns and M-16 rifles at our heads. From their ships, they trained high-intensity water cannons on us and shot our rowboats out of the water. The Seattle newspapers called it “The Battle of Oak Bay,” and published photographs of Coast Guard boats attacking our fleet with water cannons. The next day’s Seattle Times pictured me in my wetsuit swimming in the cold waters of Puget Sound after the water-cannon assault had capsized my boat. In the days leading up to the boat blockade, we had trained with Greenpeace volunteers who warned us that if we were swept into the cold, turbulent waters of Puget Sound, we would be at risk of death. All 46 activists who agreed to take part in the blockade knew we were facing 10 years in prison — and serious risks to our lives. In his article, “The Peace Blockade and the Rise of Nonviolent Civil Disobedience,” Matt Dundas interviewed boat blockaders Kim Wahl and Renee Krisko about those risks. Their responses revealed the attitudes shared by the peace blockaders on the eve of the confrontation with the USS Ohio. “Despite threats of ten years in prison and a $10,000 fine, none of the protesters backed out.” Wahl added, “I just knew in my heart that I had to do it.” Looking back later, she asked her friend and fellow blockader Renee Krisko why they hadn’t thought much about the potential repercussions. “Because we thought we’d die in the water,” said Krisko. No one lost their life that day, although our boats were rammed and bombarded with water cannons that sent us flying into the waters of Puget Sound. We were fished out of the water with long metal pikes, then arrested at gunpoint. When the Coast Guard boarded our sailboat, the Lizard of Woz, an armed officer aggressively aimed his gun at point-blank range at our captain, Ted Phillips. The officer cocked the gun and put it right against Ted’s back; for a long period seething with tension, Ted’s life was at risk. “The pistol in Ted’s back was cocked, and the finger on its trigger shaking,” Douglass recalled. Many onlookers and news reporters expressed shock and astonishment at the massive and violent reaction of the Navy and Coast Guard to our small nonviolent blockade. In his book Lightning East to West, Douglass wrote that, from the perspective of the U.S. military, the stakes were very high in our confrontation with the Trident, so the Navy and Coast Guard were determined to take any steps necessary to overpower and suppress the peace blockade. While awaiting the arrival of the USS Ohio, we spent two weeks living, eating and sleeping on board our sailboats. Those days and nights were packed with inspiring moments, but one of the most moving occurrences of all was the seaborne vigil held on a prayer boat a few days before the Trident arrived on August 12. That boat carried Archbishop Raymond Hunthausen and 12 bishops and church leaders from six denominations of the Church Council of Greater Seattle who had voyaged out on the waters of Puget Sound to express their solidarity with our peace blockade. The chain reaction of conscience had traveled through the decades, person to person, from the courtroom in Nuremberg to the waters of Puget Sound. As Jim Douglass explained in his interview with Street Spirit, Archbishop Hunthausen’s uncompromising condemnation of nuclear weapons had sparked priest after priest, bishop after bishop, to condemn the arms race. That chain reaction eventually resulted in the entire body of the U.S. Catholic Bishops releasing the pastoral letter on nuclear weapons, “The Challenge of Peace,” in 1983. The 1983 pastoral letter was issued by the U.S. bishops at a time of global peril and dangerous instability in the nuclear arms race. The Reagan administration had scrapped arms limitation talks with the Soviet Union, and was presiding over a massive expansion of the U.S. nuclear arsenal fueled by one of the largest increases in military spending in U.S. history. At this same historic moment, the launching of a fleet of Trident first-strike nuclear submarines — the most lethal weapon system in history — had destabilized the precarious balance of a world already poised on the brink of nuclear oblivion. Due to an ever-increasing level of tension between the United States and the Soviet Union, the nation’s nuclear arsenal was set on hair-trigger alert, and the Trident submarine suddenly made it possible to launch a devastating nuclear first strike. The highly respected Bulletin of Atomic Scientists had set the Doomsday Clock at 4 minutes to midnight as a measure of the imminent threat of global nuclear annihilation. The archbishop’s stark words conveyed the terrible urgency felt by many people of conscience who had come to realize that the arms race threatened all human life everywhere. Hunthausen echoed Martin Luther King’s warning that, in the nuclear era, the choice is between nonviolence and nonexistence. At that very moment, during one of the darkest times in our history, the bishops released “The Challenge of Peace” and helped break through the public silence surrounding nuclear weapons in a major way. 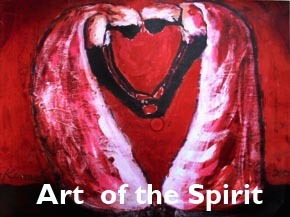 In doing so, they gave a great deal of hope to the movement for nuclear disarmament. Jim and Shelley Douglass played a HUGE role in the process that resulted in Archbishop Hunthausen’s own acts of conscience and resistance. They would never say that, obviously. Shortly before the USS Ohio was about to enter the Hood Canal, our Lizard of Woz sailboat docked at the shore for a moment, and a reporter breathlessly asked Jim Douglass how he expected the upcoming confrontation with the Trident submarine would turn out. It was a made-to-order media moment, a golden opportunity for a valiant reply that would echo in the nightly news broadcasts. Instead, Jim was patient with the interviewer, but deliberately calm and self-effacing. He refused to buy into the drama of the moment, and seemed uninterested in making any grandiose statement. He simply said that he hoped that life would go on for everyone, and it was not in his power to see into the future. I learned a great deal from Jim’s modest response at that moment. Our presence on the water that day was meaningful, yet we were only one small part of the fabric of life. And reverence for life was the point of everything at that moment — far more important than offering dramatic sound bites for the media. We were simply taking a very modest stand for life, just like the trees and hills and wildflowers and the seals swimming in Puget Sound — nothing more, nothing less. Jim Douglass Interviews and Articles (All).